You can change the status of an appointment to mark it as a missed appointment. 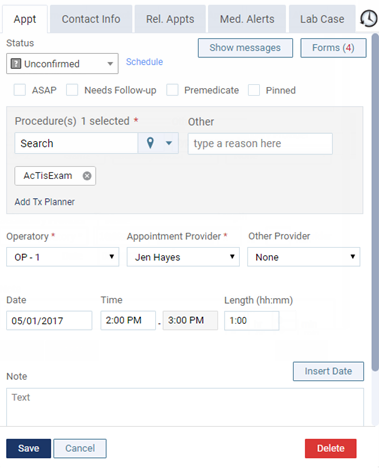 When you mark an appointment as missed, it remains on the schedule but is transparent, so you can easily differentiate it from other appointments. Also, you can specify the reason that the appointment was missed and the date and time of the cancelation. The options for missed appointments appear. Type a reason for the missed appointment, and change the date and time of the cancelation as needed. Date and Time - The current date and time are inserted automatically when the appointment status is changed to Broken or No Show, but you can change the date and time to reflect correct date and time of the cancelation if needed. Advanced Notice - If you have changed the status to Broken, how long before the scheduled time of the appointment that the status was changed appears for your reference. Reason for Missing Appointment - If known, type the reason that the appointment was missed. To save the changes without rescheduling the appointment, click (or tap) Save.